I’ve always been a fan of the beet. I love their sugary sweet flavour after they’ve been roasted in the oven and I love how they turn everything on your plate a deep shade of pink. I’ve turned a simple ho-hum hummous into an electric shade of fuchsia just by pureeing a small roasted beet into the chickpea-tahini mix. Even my colourful lunch (leftovers from last night’s meal) turned into a veritable rainbow with the addition of a few baby beets. For the longest time, I used only the beets but had no idea what to do with the leaves…so into the compost bucket they went. However, emboldened by an article about eating what I was throwing away, I steamed them up and served them with a bit of butter. Amazing! Tangier and bolder than spinach, they were much more “meatier” than I expected and a hundred times more delicious. Similar in taste to kale, I quickly became a beet green convert and tried to get others into the fold. However, when it comes to beets and their greens, there aren’t very many willing converts. When I’d wax poetically about the red root, people wouldn’t hear it. Instead, they’d tell me all kinds of horror stories about how their mothers would force feed them beets until all their bodily fluids would turn red from the trauma. Hmph! Sometimes you just don’t know what you’re missing. 1. Heat olive oil and garlic in a large pan. When garlic becomes fragrant, add in the beet greens. They might splatter a bit, but it will all simmer down shortly. Turn down the heat and squeeze some lime juice into the mix and let the leaves and stem wilt for a few minutes until tender. I love beets and beet greens! I’m a big fan of beets AND beet greens, too!! (My aunt from Winnipeg always says, you’ve got ANOTHER way to eat beets?) But the greens often go to waste because I just don’t get to them in time. Then I discovered Greek Greens which adds a day or two of holding time. I grow beets in my garden and use the whole thing. Their only downfall is that along with turning your food a lovely pink shade, they also turn your hands that colour! I’ve always wanted to try beet green bit I’m scared. This sounds good though. I would try this. One of my favorite ways to use the whole beet is to cut off and sautee the greens, roast the beets, make some risotto with gorgonzola, and add the sauteed greens and roasted beets at the end. Sooooo delicious, and electric pink. I like to use golden beets too, though. They are beautiful. i have to admit that i’m still a wee bit afraid of beets in general. i love kale though . . . and chard . . . so maybe it’s time! I admit to being partial to pickled beets. But even non-pickled ones are good. My youngest loves roasted beets and got disgusted when I tried to pass off some canned ones at the table one night in the interest of time. I do try to cook the greens as well, but don’t always get to them. Sometimes, people who don’t like red beets can tolerate golden beets. That’s how I got the hubby to eat them. Best roasted with maple syrup and mustard, and also a recipe from “Mangoes and Curry Leaves” called “Beets with Tropical Flavors” which involves curry leaves, coconut milk, shallots, chiles, vinegar and sugar. Best beets EVER! I’ve yet to try beet greens, though, and I’m going to have to make the move. It isn’t as pretty as yours but I’m new to all this Blog-editing and such. Having a Meditteranean background, the only way my mom would serve beet salad was with olive oil and vinegar and salt…greens and all. Thanks for this great recipe. It’s good to see that you also like beets a la Mom. You have not diapointed again! I love to come and drool over the pictures so much!! I think I’ll pass on the beets, but the pasta is a must try!! ooh, ak, i like the looks of that recipe! yum. megan, give it a try. it’s so similar to red kale! brilynn, true about red hands, but i don’t mind! sara, totally give them a go. you might be surprised at how good they are. i totally was! mmmm, maven, that sounds awesome. i love creamy risotto and a pink would would be fantastic! ellen, i too love pickled beets! lisa, i’ve never had golden beets and i really want to give them a try. welcome back, barista! congrats on your new blog and i agree whole heartedly about pumpkin pie. joanne, i think i’d love your mom’s salad! hi there! i’ve never been a beet fan, but you make this look so good. if the leafy green part is similar to kale or spinach, i’d definitely love to give this a try. What gorgeous color! 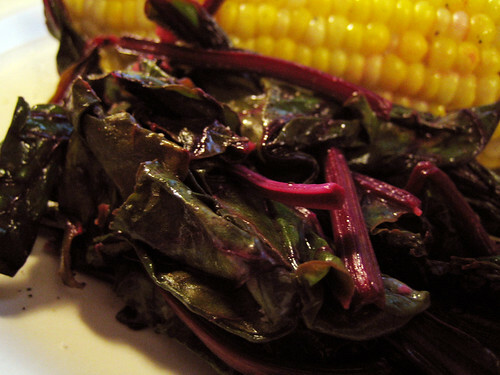 I’m not a fan of beets, actually, but the greens look delicious [they remind me of Swiss chard]. I love beets as well! I’ve never though of eating the greens before. I’ll have to give that a shot! Same here, I love beets (and have posted several beetroot recipes on my blog), but I haven’t cooked with beet greens before. Must. Soon. I also like a salad of cold cooked (preferably roasted) beats and their greens. I like it with olive oil or a good nut oil, a tasty vinegar, and feta or goat cheese sprinkled on top. I’m a huge fan of beetroot, so it’s great to find yet another beetroot recipe! My first post on your beautiful site! I just had to say: you’ve converted me! I’ve always loved beets but just never got around to the greens because they always looked…stingy. Well, tonight was the night. I changed mine up for lack of lime and instead used sesame oil and some seeds. So good! Thanks for the inspiration!